Low-budget smartphone made ​​by Huawei showcased at Mobile World Congress 2013 recently, that’s the the Huawei Ascend G350. Huawei Ascend G350 has a 4-inch capacitive IPS touch screen display with the support of a resolution of 480 × 800 pixels. While the dimmensions is 134x67x9.9mm and the weighs is only 150g. This new Ascend lineup is running Android 4.1 Jelly Bean seems to rely on the support of dual core 1GHz processor plus Adreno 203 GPU and 512MB of RAM. Meanwhile, as one surefire storage solutions are offered, Huawei Ascend is G350 is sports with 4GB of internal memory which can be expanded using MicroSD cardup to 32GB through the existing slot. This phone is also has dual SIM and Dual Standby, which can be running on GSM/WCDMA network. sports with 5 megapixel rear camera and VGA front-facing camera, this phone is also equipped with several other features such as Bluetooth, WiFi, 3.5mm audio jack, GPS and powered by 1730mAh battery capacity. 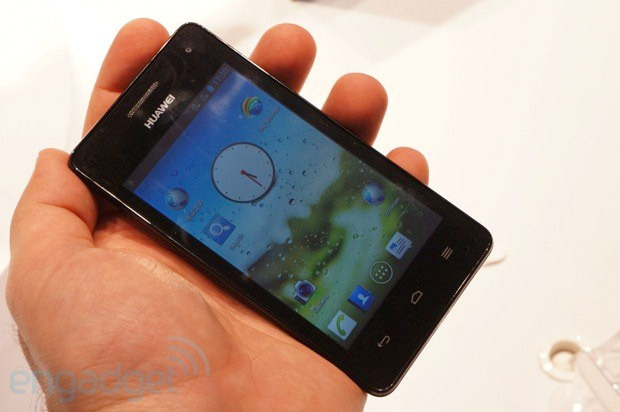 Like the Huawei Ascend G330, This new Huawei Ascend G350 is also reportedly equipped with water and dust ressitant. Since this Huawei Ascend G350 is said to have passed the IP68 standard. Unfortunatelly, there is no information about the price, but the Huawei Ascend G350 is expected to reach the market in May or June 2013. Dependendo do preço pode ser um bom terminal. É uma versão dual-sim do G330 já existente.